I love salt or sugar body scrubs, especially if they're moisturizing. And there's just something so refreshing about the smell of citrus in the Winter time. 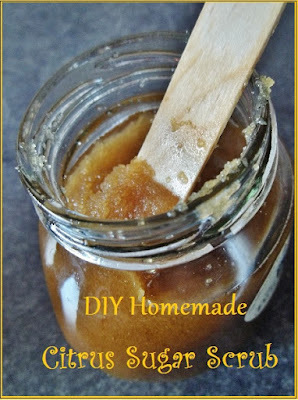 I told the kids that we could make this DIY citrus sugar scrub and do a pedicure yesterday, but we never got around to it! I ended up making this scrub today. It's pretty basic. 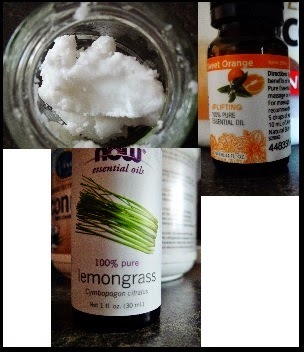 All it has is coconut oil, brown sugar, Sweet Orange essential oil and Lemongrass essential oil. I thought that I would just fill up my jar half way with coconut oil and mix in almost just as much sugar. My coconut oil was solid since it's Winter. I warmed it up by putting the jar of coconut oil in hot water until the coconut oil melted. Once the oil was melted, I added the brown sugar until it was the consistency I thought it should be. It really took more sugar than coconut oil. I added about 30 drops of Sweet Orange essential oil and about 10 drops of Lemongrass essential oil. It smells yummy. Coconut oil is so moisturizing. I've made both salt and sugar scrubs with olive oil. This is my first time making a scrub with coconut oil. Future Fashionista and I used it during our Citrus Pedicure that we did. It left my skin feeling so soft! I also used it in the shower. It was a little hard because of the coconut oil, but it was well worth it. I had a hard, scaly, dry patch on my elbow and it is so much softer now. Note: If you live in a cold climate, the coconut oil will reharden and turn white again. We used a craft stick to stir and get our scrub out of the jar. Do you like homemade beauty products? ﻿Take a minute and follow on Facebook ??? Pretty, pretty please? With a cherry on top? Make sure you never miss a Mish-Mash post. Follow by RSS or Email HERE.